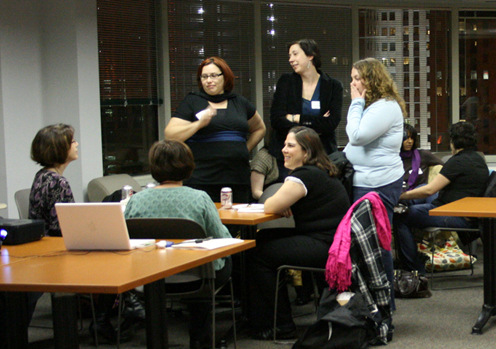 Last week Roundarch hosted Chicago Geek Girls‘ monthly dinner gathering. Chicago Geek Girls is a local branch of a network devoted to supporting the work and play of women who identify as geeks, many of whom work in tech jobs and/or companies. This was only the Chicago branch’s second formal dinner meeting and Roundarch was happy to invite them over to our office for tech talk, pizza and wine. Geoff Cubitt, President and CTO of Roundarch, explained a bit about Roundarch, what we do, and demo’d a few of our more innovative projects. Niti Vaish and Rachelle Bowden, a Project Manager and Information Architect from Roundarch, talked about what makes a good company great. 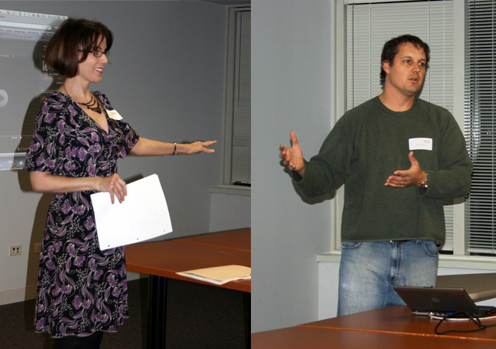 Other speakers were Heidi Miller, who encouraged people to enter the Knight News Challenge and Theresa Carter, who showed us the history of her site The Local Tourist and solicited any feedback the group may have. Overall it was a great event. We were able to meet and share ideas with many interesting women and celebrate being geek girls. Even Geoff.